PW - In the late 1970s and early 1980s I was fortunate enough to spend a considerable amount of time studying at the British School at Rome, that great institution set in the Valle Giulia next to the Galleria Nazionale d'Arte Moderna. I was engaged in postgraduate research on some eleventh-century wall paintings in a little church just off the via Appia, but many of the other residents were painters or sculptors and it was this mixture of academics and artists which has made, and continues to make, the British School such a stimulating place to work. Most of the artists were there for an obvious reason: they wanted to grasp the opportunity not only to respond to the material remains of the city and its environs but also to experience that wonderful purity of light that Rome enjoys. This did not mean, of course, that their work was necessarily in the classical tradition. We formed a loose-knit community, - archaeologists, classicists, musicologists, art historians, historians, painters, sculptors, architects and printmakers - bouncing ideas off one another in a mutually beneficial environment which is sadly only rarely created. Although your career avoided Rome, these introductory comments are not irrelevant to your art. When we first met, in Brighton in the early 1980s, I could immediately see that your approach to painting would have made you an ideal recipient of one of the Rome prizes. All your works are underpinned with a conspicuous sense of place and moment, invariably showcasing a brilliant response to light and texture, but there is also a deeper, intensely serious awareness of painting's potential relationship with poetry, literature, science and with the art of the past. This questing intelligence may be self-evident in the paintings themselves but no work of art suffers from having its context explained by its creator, so I wanted to ask a few questions in that connection. In the sense that the work of every artist - be they a sculptor or a writer - is to some extent autobiographical, which events of your life do you see as crucial to your development as a painter? AH - Well, this question appears so simple, yet in trying to answer it coherently I find myself peering down the well of time that constitutes my own life, trying to pick out seminal moments. Firstly it's true to say that my work has always veered between the figure and the landscape, even before I had any formal training. However in terms of actual moments that were crucial it has to be the year that I went to Foundation College at Lincoln as a mature student, in 1969. Before this I had been an apprentice engineer so you can imagine the shock of this complete change. Certainly the act of travelling and the acknowledgement of a particular place has always played a central role in my work. But my own sense of history rejects what might be called the String of Pearls theory, each ‘ism’ begetting the next. Rather history for me is a soup of totally interrelated actions which constantly changes as we shed new light on it. This is one reason why I have no interest in being a ‘Sensation Artist’. I only want to be sensational in my ability to paint ambitious, beautiful paintings. PW - Many of your paintings of the last decade seem to me to have been strikingly site-specific. Was your choice of these locations - Ayers Rock, Skyros, Mexico - serendipitous or are these landscapes places of pilgrimage for you? AH - Site-specific, yes, but never topographical. Serendipitous, yes, but as I have said, the act or momentum of travel is the central issue, whereby along the way certain places are recognised as being ‘particular’. These can become markers to which I may return many times. In that sense they sometimes become places of pilgrimage. I have always felt that my peregrinations carry overtones of the Grand Tour. Except of course I travel very modestly, usually alone, and find my own places of interest rather than following the itinerary that made it so compulsory to stop off at certain famous destinations, be they natural, such as the Matterhorn, or steeped in history, as the Pyramids or St Mark's Square in Venice. The other thing which has just struck me during this conversation is how all my locations have a deep sense of ancient history. I don’t think that I would enjoy Sue Lawley's desert island because it would be virgin territory. There would be no ghosts and ghosts that tremble at the edge of one’s vision are a very important thing. Denis Cosgrove, in his essay for my ‘Landscape & Memory’ exhibition in 1997, said that 'memories resonate at the very surface of (his) paintings', and I particularly like the way he distilled that intention. So in retrospect; the journey, the place and finally the work itself all become inextricably mingled. Their histories cannot be separated. All play an equally important role in the realisation of the final painting. PW - For your Deluge paintings of 1996-97 the starting point was Leonardo's work connected with cloudbursts and floods. Are any of your most recent paintings as closely rooted in, or inspired by, the work of Old Masters? In common with most curators of historic collections I always hope that the art of the past informs the present and am interested in the way responses differ. AH - The Deluge was very important and it helped set the scene for the emergence of all the work in this exhibition. Most artists I know constantly look at, read about and absorb the lessons of the past; not only of the Old Masters but their peers as well. The past informs to a critical degree. Most artists I know are wonderful plagiarists (although they might not thank me for that observation). Leastwise I certainly know that I am. Look at a Rembrandt, a Rothko, a de Kooning or an O'Donoghue. All of these painters (amongst others) move me profoundly and I know that whole sections of their language will enter mine. I like this - the past becomes the present and out of this marriage is born the future. PW - In the present show, 'Deep Waters', blue has become the dominant colour of your paintings. I don't think this is just because the subject matter relates to sea and sky – which after all contain white, yellow, black, red and green - and I have noticed this particular, extraordinarily strong blue emerging, brighter and brighter, almost plangent, in several of your big paintings over the last few years. AH - Ultramarine Blue is the blue of the Medieval Church, it’s the blue of the Virgin Mary, it’s the blue of the Princes and Popes of the Renaissance. It is the perfect blue made by grinding up the semi-precious stone Lapis Lazuli, and purifying it by a complex and difficult process. Sometimes referred to as True Blue, it was and still is one of the more expensive pigments (although now it is made from a chemical process). But I love it. I found my blue, called A19, in the form of big fat crayons manufactured by the Unison Company. I know buy kilo bags of the pure pigment A19 and make my own oil and watercolours. Originally I used it to represent the total blue sky of the Australian series. The Deluge painting demanded it and so this single colour has acquired more and more significance, culminating in the present show. It’s paean to an ancient colour. PW - To what extent are your paintings evolutionary in process, both internally and in sequence? AH - 'Evolutionary' is an interesting and I think accurate word to describe the processes that make my art, both in the intellectual dimension and the 'modus operandi' of the works' construction. For instance I have long painted in series, working on 2 or 4, sometimes more, canvases at the same time. The starting point for a set of canvases is similar but the evolution of the work, i.e. the doing of it, causes mutations and changes often based on chance happenings, and this means that each canvas will be unique. These processes have become endemic to my work. Likewise colours and mark-making evolve and move on from series to series. 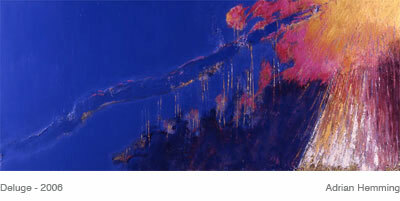 For instance I said that the blue was originally used just to create sky in the Australian works. This then takes on more prominence in the Deluge series and finally becomes total in the Deep Waters series. So too do the red desert paint marks in the Oz series, which give way to the fluid watery mark-making world of Deep Waters.